5 1991 – Und sie fliegen doch! (…) But now I have a special question for you, Asket: For a long time I have been trying to get Semjase’s permission to take a photo of her. Unfortunately however, I can’t get consent from her. But how would it be if I could capture you and Nera on my film now; would you allow that? 33. If this would please you, then of course. 34. With Semjase, unfortunately, if you took a photo of her and distributed it on the Earth, her security would no longer be guaranteed. 35. For this reason she also had to prohibit this when certain difficulties emerged in your group. 36. I only fear that the photos you take of me and Nera now, won’t come out very well. 37. I know from my stay on Earth, that the images were always very poor, when they were taken aboard our ship or in the surroundings. 38. They mostly were very unsharp or simply blurred. 39. This has to do with certain energy radiations which are harmless to living forms, but distort everything, and often impair and change the colours of colour films. So you have dedicated yourself to filming then? And what about the apparatus which Semjase assembled for me, to get better photos? 40. For my own interest, I have occupied myself with photography, and so I also recognized the difficulties with the faltering energy radiation, which is even able to destroy the film in some cases. 41. But which apparatus are you speaking of? Semjase assembled a device for me to be able to photograph better. 42. Semjase has explained to me what type of device it is, which unfortunately you would not understand. 43. I am sorry to tell you that the images with this device will with certainty not be very good either. 44. But we will strive together to construct an effective device, to provide you with better photo material on a later opportunity. 45. But if you nevertheless want to take some pictures of us now, then you may do so. 46. If you make no use of it and keep it only for yourself, then you may take a group photo of us all, including Semjase. Thank you, Asket. Of course I will keep it for myself, if it comes out good. 47. So take the photo now. 48. At a later point in time you will also be allowed to take several photos of Semjase, when she is no longer at risk on Earth. 49. But this may take several more years or even decades. 50. From my part, a recognition doesn’t really matter, because I will not return to Earth for the time being. 51. With Nera it is the same. 52. Besides in the whole Universe there are life forms that look deceptively similar to each other, whereby a person can be mistaken for someone else. 53. You call these doubles. I understand; I will take the photos now. (Asket, Nera and Semjase stand together, and I take more photos now. Unlike Semjase, Asket and Nera don’t wear space suits, but normal clothes, which are actually quite different from those I know of Earth women’s clothing. But they all are very well dressed with them.) – Later, it turned out, unfortunately, that the group photo was completely unrecognizable. 314. That should probably be enough, because we still have many more things to talk about. Boy, that’s a shame. But the women, the doubles of Asket and Nera, where are they? 230. In the country of America. 231. I did, however, say that already. Can you give me their addresses and mention further details about them? 232. I wouldn’t like to do that for certain reasons. You are always so mysterious. 233. In certain matters, I have to be. Col. Colman S. von Keviczky (1909-1998), an internationally prominent ufologist and Hungarian military scientist, founded ICUFON (Intercontinental U.F.O. Galactic Spacecraft Research and Analytic Network) in 1966. He originally published a report (see pages 114-120 of the book – Ausschnitte aus Zeitungen und Journalen) on the Meier case, which was sent to Wendelle Stevens and Thomas K. Welsch of Genesis III Productions, Ltd. on June 9, 1980. Following is a scan of pg. 5 of the report which is available on pg. 120 of the book ‘Ausschnitte aus Zeitungen und Journalen’, that covers the Asket-Nera photos. FIGU co-founder and Core Group member Guido Moosbrugger has published this book in September 1991. And on pgs. 266-267, Guido defended the below photos of Asket-Nera from the criticisms so far made on those pictures by the skeptics. Close up of Semjase and Asket from Pleiades, DAL-universe. 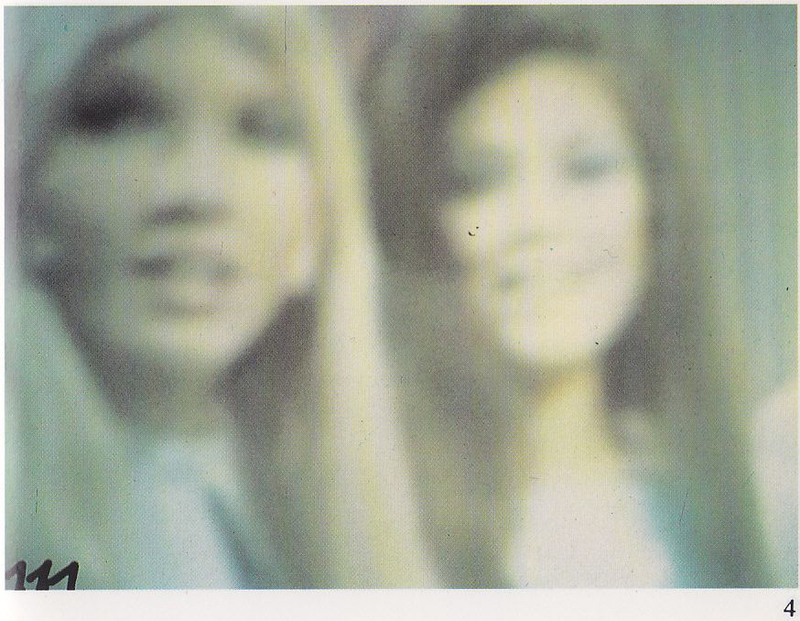 After numerous brilliant and focused photographs of UFOs evidently Billy was unable to take clear picture of his girlfriends from outer space: Semjase and Asket. The reason – Their bodies’ “Galactic radiation”. a) The radiation bluff is in the reality a simple out of focus photograph. As I (BMUFOR note: Ray Stanford) turned through one of the albums there…I saw a photograph of two women. Wendelle said that Meier told him that these were two of the space gals. I believe one of them was supposed to be Semjase, and I forget the name of the other one, but they definitely were supposed to be space women. I noted that they were wearing very heavy makeup, possibly false eyelashes, but had very heavy mascara and paint on around the eyes. I asked Wendelle about this, I said it’s surprising for me that extraterrestrials supposedly so advanced would come here and feel it necessary (since they’re not supposedly walking around in the public, but just photographed on a casual visit out of the ship), to doctor their natural body up in this way. And Wendelle told me that Meier claimed that when the aliens first came to earth they didn’t use makeup at all and had never developed it. But when they saw how it enhanced the appearance of the women on earth so much, they developed it and started using it themselves! (documentation K). B.R. : Are they human looking then? D.: Yeah, really human looking. Except in two of the closeup photographs, the earlobes come way down and attach onto the jawbone. But otherwise they look totally human, and they (the aliens) explained to him (Meier) that anyone whose earlobes are attached to their jawbones, their sense of hearing is tremendously improved. And told him to do an experiment of pulling on his own ears real hard, and seeing how their own hearing changed. And when I do it, I can definitely hear higher frequencies, all of a sudden just clicks in..
2. According to Billy the extraterrestrial women, at least those he has got to know, only use colored eye lenses and possibly colored head hair, if at all. All other claims belong in the realm of fantasy. 3. The claim that Billy has declared two normal Earth women with fashionable long hair as aliens – and his wife Kalliope was wearing a blonde wig for this purpose – is frankly ridiculous. Even with the best will in the world I cannot imagine how one would prove with the help of a wig, that the wearer is an extraterrestrial woman. I see practically no similarity between Kalliope and the portrait of Asket (mistakenly referred to as Semjase), even with a blond wig. And Billy’s wife of all people would have participated in this fraud, although she is the last person to consider, as can be confirmed by all those who have personally got to know her. 4. Another note on the strongly elongated earlobes of the Pleiadians. On one hand they represent the only anatomical difference between the aforementioned extraterrestrials and the white Earth people, on the other hand it is absolutely erroneous to speak about a better hearing because these ears are only slightly longer than ours (about 2 cm). Now this is a surprise, because I really didn’t expect you yet. Greetings and be welcome – also because it was my wish to see you, which is why I wanted to try to reach you the next few days. Although Florena was here and I could have asked her for you, I didn’t think it was so urgent. Nonetheless, I am glad that can talk to you now after all. Greetings, my friend – something seems to concern you? You’re right, and if I could speak about it right now, that would be very nice. 2. Do not hesitate to tell me what you have to say. OK, fine: Once again something is preoccupying me that I cannot understand. It is linked with conspiracies and defamations which, by and large, don’t bother me but they do raise several questions. You are familiar with that schemer and defamer Korff and this Luc Buergin. Together they recently taped an interview with my dear ex-wife which they intend to disseminate worldwide as a videotape in July, apparently with an explanation or “exposé” regarding the two photos of Asket and Nera that I, allegedly, photographed from a television unit, and which are said not to be Asket and Nera but two American Asket/Nera look-alikes. You mentioned them yourself in Contact 39 when you stated that two young women live in America who work in the same business, and are spitting images of Asket and Nera. 3. The two photographs do show the two look-alikes from America. How do you mean that? I personally took the pictures of Asket and Nera. 4. This is a fact. However, the problem is that you never received the original photographs, which would have been printed from your original negatives. 5. Are you really unable to remember the incident? 6. Quetzal’s and my visit on February 3, 1985, when we explained to you a few of the connections as they pertained to the photographs you just mentioned. I have no recollection of this. What happened at that time? 7. We revealed to you then that you had received fraudulent pictures which depict neither Asket nor Nera. Now I don’t understand anything anymore. 8. Oh, now I see. 9. You really have forgotten everything, and with certainty this is linked to your life-threatening condition at the time, including your partial amnesia. That is why you are unable to remember many of these things. Please do not keep me in suspense now. 10. At the time we did not wish to deal with these matters on a public level. But I do feel that this issue must be addressed if I hold fraudulent Asket/Nera photographs, which I have been selling with such a caption until now. If this is actually the case, they’re really going to go after me ferociously. 11. Well, it isn’t really your fault. Blame must be directed toward your photographer. He allowed himself to be forced into such a fraudulent scheme by a group of “Men in Black,” and then he cheated you with the resulting photographs. I am familiar with that riffraff. Several of them pursued my daughter Gilgamesha once when she was coming home from school. One of them chased her with a knife in his hand. When they couldn’t catch her, the cowardly bums escaped in a large, black limo. 12. I am familiar with the story. But hear this then: It seems that I must again relate all the information to you now, and this time in a way that brings it before the public, providing you wish to record this conversation for future use? 16. From the beginning of the contacts with us you never allowed yourself to be intimidated by any of the schemes of the “Black Men,” regardless of how despicable, dangerous, indeed, lifethreatening they were. Since you simply laughed at their assassination attempts and always carried a weapon—with the appropriate gun license, I must add—the “Black Men”, instead, resorted to making you look preposterous and highly questionable before the world. 17. Because they were unable to get close enough to you, they aggressively forced people who worked with you, such as photographer Schmid, to discredit you in a future, long-term basis. 18. They coerced S. into forging the photographs you had taken with our permission. In other words, they made him completely forge or adulterate your pictures. 19. Several times during your early contact period with us, your own films, which you had photographer S. develop and make prints of, were substituted with totally different, adulterated films. Therefore, from the very beginning you received many counterfeit negatives and photographs or adulterated pictures. 20. This is also what occurred with the film on which you recorded the images of Asket and Nera, and which you allegedly did receive back after several months only. But in reality what you received was, in fact, a product of the “Black Men” who had discovered and photographed Asket’s and Nera’s doubles in America. These pictures were then processed and given to you by S.
21. You, of course, believed they were the originals, but they were forgeries and deceptively similar to your own, authentic photographs. 22. For this reason you did not realize you had been defrauded, and neither did we. 23. In fact, we were unaware of this deceit until the autumn of 1984, when we brought your photos to Asket because she, too, wanted to have them. 24. Of course, she noticed the deception immediately, and because of this, we began investigating the matter and discovered that the “Black Men” were behind the entire scheme and it was they who had forced the photographer into their services. 25. Upon their mandate, Schmid produced the forged photographs and handed them to you as though they were originals—whereupon you always assumed they were the actual photographs you had taken yourself. This was the case also with the pictures of Asket and Nera. 26. With regard to these particular photos, we discovered that Schmid immediately submitted the film, which you had just handed in to him for processing, to the “Black Men,” respectively “Men in Black,” as people in your ufological circles call them. Within a few days they found and repeatedly photographed the Asket/Nera look-alikes, and this is how the two pictures came into being with which you are familiar and which were passed on to you. 27. The Gizeh Intelligences play somewhat of a role in this matter too, as you are well aware. 28. Although we were unable to clarify their exact association within this plot. 29. Clearly, however, they negatively influenced a vast number of terrestrials through their telepathic impulses, in an effort to harm, defame and even assassinate you, which they attempted several times—fortunately without success. 30. Everything was being done to make you and your mission appear preposterous, specifically by accusing you of producing photographic forgeries. 31. The “Men in Black” wield their impact even today, and so do the decade-old influences of the negative telepathic impulse machinations against you and your mission, which shall be destroyed. 32. The impulses by these Gizeh Intelligences presumably affect all those people who are working against you and the mission with their schemes, defamations, and other negative machinations, although these individuals never realize they are being influenced by these impulses. Not exactly encouraging. – But how long will these Giza impulses still be effective on the Earth? 33. Under certain circumstances this may last another 200 or 300 years. What am I going to do now with the photos? Under these circumstances I can no longer use or sell them. I really feel like a crook now after claiming they were photos of Asket and Nera. 34. You are not guilty in this matter. This scheme involving the Asket and Nera photos dates back to 1975 or so, a very long time ago. And yet, the consequences are only appearing now? That’s what I call a long-term calculation. This is astounding. The situation actually warrants my respect. But why didn’t we record this as part of a contact report? Then we could have openly clarified this matter much sooner. 36. Unfortunately, it could no longer be handled on your end. 37. After your last contact with Quetzal on October 31, 1984, and after you had finished your OM book, your health was in such an appalling state that for several years you were closer to death than to life. For this reason you were incapable then of jotting down the contact conversations. 38. By November 17, 1989, your health and strength had finally improved to the point where you were able to record our conversations again in writing. 39. You know yourself how many things and facts you had to relearn and how many other things you were unable to relearn at all. Furthermore, your memory had been organically damaged, and this is the reason why it cannot be as active as it was previously. 41. Just remember the power and capabilities your consciousness possessed when it allowed you to accomplish those many astonishing feats. Unfortunately this is the case, I know – apart from that often too much is demanded of one, so one cannot always concentratively devote to those things, which require it most. But may I ask where this photographer Schmid came from, because he never gave me his address. He took my films and negatives at my place and also delivered them to my place. Once asked for it he explained that he could not give his address, because his wife could not know that he visited me. She is against me and becomes furious if she only hears my name. He always said that he was from the Rheintal. 42. The man died many years ago. 43. Your question is therefore redundant. 44. I’d only like to say that it was a lie, that he lived in the Rheintal. 45. The reason however, that he didn’t give you an address, may well have been the fact that he was under constraints of the <Men in Black>, who really massively threatened him. He always seemed a bit anxious. I still remember that very well. 46. With good reason, if you think of the <Black Men>. Actually I’m sorry for the intriguers and slanderers, because if they are blinded by the impulsetelepathic machinations of the Giza intelligences there is little hope for them that in this life they will ever come to reason and sensibility, hence they will ever go more astray. – By the way, you have moved these Giza guys to somewhere else – now is it really so, that they cannot get back to Earth from there or can contact other intelligences to influence them and bring about new harm? 47. The Earth people can be sure that they will never be bothered again by these degenerates. 48. Other intelligences are also safe from them. Yes, you also explained that to me once, when I remember correctly. But now I just remembered another question regarding the “Men in Black” and their machinations with the look-alike photos and the photographer: How could the “Men in Black” find the two American women so easily and quickly, and then photograph them in the right way? 62. These “Men in Black,” as they are called because of the black clothing they constantly seem to wear, have always had access to unfathomable resources—or what normal people or citizens, rather, would consider them to be. It was a simple task for them to locate the two young artists. 63. Once these extremely unscrupulous men set their mind to something, nothing remains hidden from them. 64. The photos of these look-alikes, of whom I actually spoke during the 39th contact on December 3, 1975, were not taken in the presence of the two young women. Instead, their images were copied from movie footage to which the “Men in Black” had gained access. 66. In any case, individual photographs were copied from it and, together with photographer S., they selected those which most closely resembled your own photos of Asket and Nera. This is how they were able to deceive you. 67. The purpose of the entire matter was to create pictures of specific situations identical to those you had taken of Asket and Nera. 68. The objective was for you to normally, and unsuspectingly, disseminate and sell these counterfeit, or rather forged, photographs of the two look-alikes to interested parties, believing them to be original pictures of Asket and Nera. 69. This scenario was intended to make you look deceitful one day because, so they calculated, sooner or later one of your adversaries would examine these photographs and get to the bottom of the matter—with the result that the forged Asket/Nera pictures in the so-called review film would be recognized as the photos you were holding of those look-alikes. 70. This, then, was meant to provide the evidence for exposing you as a purported deceiver and make you and our story look preposterous and, subsequently, destroy your mission. 71. All of this was thoroughly pre-programmed in 1975 by the “Men in Black.” They concluded that the appropriate photo sequences would be found in the near future—which appears to have transpired now—and the photos would be fully exploited by your enemies soon afterwards. 72. As far as we are concerned, there is no doubt that your and your mission’s enemies are purely terrestrial beings under the influence of the long-term and still-active Gizeh impulses. Now that you have brought up so much about the “Men in Black,” I have another question: Quetzal told me once that these men are also responsible for an assassination attempt on my life. Which attempt was that? I thought it was only the case with one. The second attempt was carried out by a fanatical Jehovah-witness, who wanted to shoot my through my office window. On another occasion the Giza guys were involved in an attempt, as a bolt out of the blue hit me etc. Once Jacobus Bertschinger and the brothers Hans and Konrad Schutzbach were present, when a bullet hit me on the armour plate in front of my chest. Once Silvano Lehman was standing beside me, when a bullet hit the ground beside my feet. And also Wendelle Stevens was present once, when a shot cracked and the bullet hit the wall only a few centimetres beside my head etc. 75. These things are all known to me, so you do not have to list them. All right. – The <Men in Black> – I once asked Quetzal about it, if he could tell me where they actually come from and to which organisation they belong. He told me things that sounded simply incredible and are matters that are hardly comprehensible for people, who do not have enough imagination to imagine everything. 76. Quetzal also told you the explanations given to you are a serious confidential matter, about which you should not speak for the time being. I know, and I have always kept the agreement. I only came to talk about it, because I wanted to ask you If this matter continues to be a confidential matter and therefore has to be kept secret. 77. That is still the case for the time being, yes; and this will not change very soon. (…) If you could answer only one last question, which is on the tip of my tongue? So, you are saying that on February 3, 1985, you and Quetzal explained all of this to me about the so-called Asket/Nera photos, which actually depict the American doubles you had mentioned in the 39th contact? Well, unfortunately, I simply can’t recall any of this, I have really forgotten it completely. Now I want to ask you why you have not reminded me of these facts until now? If I had consciously absorbed this information, I would have removed the pictures from circulation and published the appropriate details in our quarterly publication, the Wassermannzeit. 98. For all these years we were not consciously aware that you had forgotten our explanations regarding these matters, otherwise we would have, of course, pointed them out to you at the appropriate time. I would like to allow myself one more question that just came up: Regarding the <Men in Black> you said that the respective explanations are a confidential matter and that this will not change very soon. Does that mean that perhaps in coming times still open explanations will be issued from your side? A lot of people will certainly be interested in that. 99. This possibility cannot be ruled out, but open explanations from our side can only be released, when we know the exact how, where and when of these mysterious beings. 100. For the time being this is still not disclosed for us, although we are striving to solve this mystery for decades already. 101. So far, we depend only on our conjectures, as they are known to you. They are known to me, yes. But you haven’t made any progress so far? 102. In some respects we have. 103. For example regarding the matter, that we now have conclusive evidence that indeed it were these <Men in Black>, who stole so many important things from your locked rooms and boxes. 104. The many possibilities they have available and which they have mastered lets them carry out such operations with ease. 105. There are practically no limits for them, and this fact alone makes them very dangerous. These guys do not even shy away from murder, not to mention their intrigues, by which they have always done a lot of mischief, have driven people to madness and to mental institutions, when they became annoying to them and they did not simply wanted to kill them, because their mental and consciousness lability offered better opportunities to cover up their crimes – not to speak about what they all caused and still cause with the forcing of people in an conscious or unconscious form, so that they do things which defy all rules of respectability and acting the right way. And what they caused and continue to cause regarding the conduct of certain governments and the military etc. is really absolutely staggering. 106. That’s all correct, but we should not talk about these matters any further, because it would not be good to uncover suspicions before they are proven. 107. And that would happen if we continue to discuss these issues. 108. The fact is, and this must be said, that all those who are aware of the existence of these beings and occupy themselves with it, have no idea what is behind it and how dangerous these <Men in Black> really are, whose machinations intimidate every normal person and let them act according to the will forced upon them, and by all means want to prevent that positive extraterrestrial forces establish contacts with the Earth people and helpfully assist them. 109. But more can and should really not be said anymore. Guido publishes an English edition of his 1991 book ‘Und sie fliegen doch!’ titled ‘And yet… they fly!‘, which contains a different explanation on Asket-Nera photos from the 1991 ed., since in 1998 these photos have been proved to be taken off the dancers from the Dean Martin Variety Show, which Meier/FIGU/Plejaren also acknowledged. Following is the text and images from 2004 English ed. which is the same as that of the 2001 ed. During my latest contact conversation with Ptaah, some extremely unpleasant facts came to light regarding the two Asket and Nera photographs which, until now, had been indexed in the FIGU photo albums and sold under this “Asket and Nera” caption. 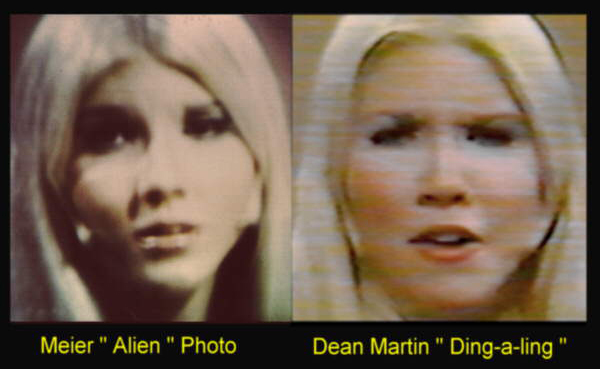 Unfortunately, during my conversation with Ptaah, he revealed that the two women depicted on the photos are not Asket and Nera from the DAL Universe, but two American look-alikes, as Ptaah had stated in the 39th Contact of 1975. These photos are malicious forgeries and were switched upon the order of and in collaboration with the “Men in Bla,ck.” The related, specific explanations can be gleaned from excerpts of the latest contact report that follows below, which will serve to clarify the situation for all friends, members, acquaintances, and interested parties as to the connections and contemptible machinations of the “Men in Black” and their hired helpers. In addition, I would Ilke to mention that the said three photographs with the (FIGU designated) numbers #109, #110, #111 will not be removed from our Photo selection. (It is unfortunate that only two pictures are mentioned in the contact report, but #109 was simply not good enough for distribution.) Instead they will receive a new caption stating that the two young women in the photograph are American look-alikes of Asket and Nera who resemble the originals so much that it is practically impossible for anyone to tell them apart — except for the ladies themselves. Here, then, are excerpts from the contact report dated May 14, 1998. Guido publishes a ‘completely revised and updated 2nd edition’ of his 2001 book titled And still they fly! (1st edition was titled And yet… they fly!) which as mentioned above contains the same photos and response regarding the Asket-Nera photos. That was that, then I have at least two things I’m pondering about. On one hand, the geoglyphs of Nazca as well as Mount Shasta and on the other hand the Asket Photo. I’d like to speak about the picture before we turn to the Talmud. The other issue we can discus after the work on the Talmud. 22. As you wish, dear friend. 23. Obviously you are keen to talk about it. It’s really important to me. Just look here, these pictures come from the Internet. It’s the falsified pictures of Asket and the alleged American look-alike. However I have not been able to spot the striking resemblance, which was talked about all these years, only a certain resemblance. I imagine look-alikes are two people that are so strikingly similar, that they cannot or can hardly be distinguished from each other. In this case however, the pictures which Piero downloaded from the internet to my computer prove it, there is only a certain resemblance. So there is no look-alike, or do you see that differently? What do you say, which picture represents Asket and which one the so called look-alike? It’s also not understandable that you never told me anything about it. 24. I see these juxtaposition pictures for the first time, because I’ve never bothered about what the look-alike should look like. 25. That may have been a mistake I have committed carelessly. 26. What I told you regarding the forgery was only based thereon, that I mentioned the information to you which was disseminated in this regard and that your photo was manipulated, so to the one which showed Asket and Nera. 27. What I examined myself were only the falsified pictures with our aircraft. 28. It was really careless of me not to concern myself with the Asket-photo and the alleged look-alike. 29. That the photo was also on the internet, I knew just as much as you did, because we have left behind these unpleasant things with the fake pictures a long time ago. 30. So we no longer bothered about it, which was obviously a mistake, but on the other hand wouldn’t have been of help, because the slanderous machinations of the adversaries cannot be stopped and cannot be ended. 31. Too much envy and hatred of the adversaries is in their thinking and striving against you. 32. It is very difficult for them to accept, that you are not impressed by all their vicious and slanderous machinations and intrigues and you continue your mission undeterred. 34. On this picture Asket is obviously seen on the left, while the person on the right side should be the alleged look-alike, who actually only has some similarity to Asket, but isn’t really a look-alike. 35. The comparison with her to Asket is ridiculous. 36. The facial expression of Asket is just as much non-corresponding with the person of comparison, as is the shape of the face and the fullness of the face. 37. Also the mouth-, chin- and eye area are recognizably different. 38. Besides, Asket has a long and slim neck, while the person of comparison clearly has a short and solid respectively thick neck. 39. Also the hair color does not match, because the person of comparison obviously has hair that is clearly dyed white blond, while Asket has a darker hair color, which however was evidently changed through a photographic manipulation and was adjusted to the person of comparison. 40. Only because of that it is clearly recognizable, that both pictures show two different female persons. 41. It may have been careless of me, not to concern myself with the comparison pictures earlier, to express my opinion about it, that there is no real similarity between Asket and the person of comparison, but only a certain resemblance. I also know that only since Thursday night, when Piero showed me the pictures from the internet. What this picture shows me, tells me that the photo in Guido’s book actually doesn’t show Asket and Nera. Therefore we have to correct this, as we put this photo here in Guido’s book together with a corresponding explanation. But you should clarify very precisely whether the photo in Guido’s book is a forgery. 42. That is necessary in my opinion. 43. I agree with you, but it will take time. 44. It would be good if, for example, Hans-Georg and Bernadette would write something appropriate for it and you would also attach our present conversation. Four years ago, Michelle DellaFave wouldn’t believe her eyes: in the Internet she stumbled across a photograph showing an “ET-Lady” which allegedly was taken by Swiss UFO-trickster Billy Meier himself. “That is not true: it is me!” states the former dancer from the “Dean Martin Show” definitely in an interview with Swiss magazine “mysteries”. In 1998 the news spread through the Internet like a wildfire: together with US researcher Kal Korff “mysteries”- publisher Luc Buergin had convicted UFO-hoaxer Billy Meier (73) of lying once again. 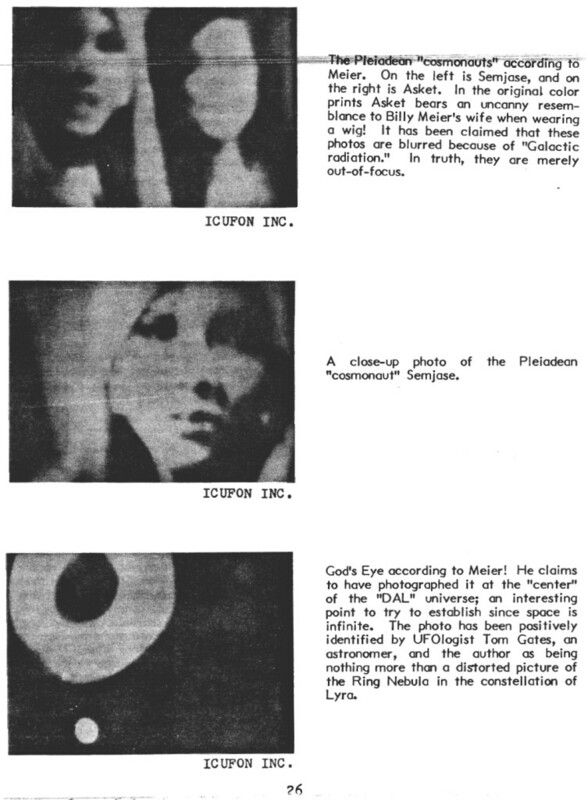 After Meier’s ex-wife provided the decisive hint that Billy had fabricated allegedly photographed “UFOs” from trash can lids and flowerpot saucers, now his snapshots of female ETs turned out to be fakes, too. For decades Billy Meier fooled the public with his UFO photographs – and brought also discredit upon thousands of credible witnesses who had seen mysterious sightings in the sky. Additionally, in the mid-70ties he had photographed two singers of the “Dean Martin Show” from the TV-screen. The “ET-prophet”, as he was celebrated by his followers, exploited commercially these blurry photographs for decades claiming them to be “original photographs of the Extraterrestrials Asket and Nera”. Believing knows no logic. So until today, despite all what is proving him wrong, Billy still claims to be the only extraterrestrial contactee. Greetings from Uriella! And so the father of six children with his biblical beard enjoys the eve of his life in Hinterschmidrueti (Zuerich, Swiss) where he is surrounded by dozens of true believers of his FIGU – and where he is still denouncing the world’s overpopulation. Many of his faked photographs taken on his alleged “space trips” were quickly removed when his tricks became public in 1998, such as those showing living dinosaurs and the snapshots of his blonde “ET-Women”. Too bad for the hoaxer that the affected one got knowledge of his swindle. She really realized this all not before 2007, the American singer Michelle DellaFave conceded. As a newcomer to the Internet she collected infos about herself and came across the Asket photo. “First I thought it to be a joke”, Michelle DellaFave explains to “mysteries”. ” I really had no information about that so far. As a spiritual being and Star Trek fan I nearly feel a bit honoured that Billy chose me as an “Extraterrestrial”. On the other other hand it is clear that my face was used illegally. Wild abuse – and no answer! And what does Billy Meier say? Nothing. Since many years he refuses to give any interviews. Instead he announces in the Internet since his exposure that “evil-willing ET-powers later have manipulated a large number of his photograps.” Upon a request of “mysteries” the man refuses to put in concrete terms which of his “space travel” photographs were manipulated later by “evil powers” and which not. Maybe he is afraid of additional exposures? In a fax of January 5, 2011, in response of a four page catalogue with Buergin’ questions, Billy Meier complained wildly;” According to your questions I answer that these do not interest me at all and therefore I will not answer them. For me and also for all FIGU members your strange request is no longer relevant (…) and I want to state that I do not wish further correspondence regarding this matter!” – – Ouch! By the way: Billy’s “UFO buzz” from the 70ties meanwhile found a mundane explanation. As US researcher Phil Langdon found out it can be reproduced with easy tools: stretch out a metal rope between two trees and fix a few UFO models in the middle section of it. If the wind blows appropliately, the oscillating vibrations penetrate the models similar to a guitar string. The models “amplify” the vibrations acoustically with extreme loudness. Becoming curious? Look here: www.figu.org/ch/ufologie/sirrgeraeusche/sirren-anhoeren . To hear the results of the Langdon’s sound-experiments click here. Ok, then look here, this Mysteries-issue. This lurid nonsense about me, the Asket-photo and the beamship sound etc. is written by the antagonist L. B. (BMUFOR note: Luc Bürgin) which is known to you. Apart from that you should also once read the other idiocy in this magazine. 32. … I could have saved myself the time, because all the nonsense that can be read in this issue is bluntly hair-raising, as you tend to say sometimes. 33. It is incomprehensible for me that there are apparently such unrealistic people who read this nonsense and fall for it. 34. The whole content is on the one hand lurid and on the other hand often lacks the reality and truth, which is why I really have to ask myself how stupid those people actually have to be, who buy and read such trashy literature and even believe these follies. 35. And regarding the author, I can only see stupidity and ignorance in his actions, because he takes his depictions out of the context of the truth and of the true facts and events and from that constructs untruths, which he presents to his readers as truths. 36. He does not take the actual truths together, but takes them out of context and also conceals the true facts and correlations, in order to create monstrous falsehoods, which he sells to his readers and followers as truth. 37. And all the people who take these crazy stupid fantasies, untruths and misrepresentations cited in this Mysteries-magazine as bare truth are to be pitied, because they also lack a sense of reality, as is the case with the author who publishes all the nonsense. 38. Quite clearly this man is someone to whom the truth speaks against his pathological delusions, of which he is unable to free himself, because he is trapped in his stupidity, dogmatism and in his antagonism and in his hubris. 39. His judgement is also suffering from that, because of which he cannot see, understand and accept the truth. 40. This all corresponds to a poor state of being unable to recognize the reality, self-deception and an inner suffering, that despite his unrighteous efforts he cannot cope with you and the truth. 41. Ignoring him and all his machinations is the only right way by which you and all FIGU community members can deal with his confused, antagonistic and dumb machinations. 42. Stupidity is unfortunately a condition in humans, which can neither be met with intelligence nor reason. Since weeks he bombards our community members and me with internet letters and by fax, but we do not respond to it. This clearly makes him angry however, so now he tries to terrorize me, FIGU and the community members with his stupid Mysteries-magazine. We however take the advise you gave us earlier, that we all simply remain silent. 43. That’s a good thing, and it should stay that way, no matter what the man in his stupidity, irrationality and vindictiveness undertakes to lure you and the members out of the reserve, as you tend to say. 44. Neither you nor any FIGU member or other witnesses are in any way accountable towards the childish follies of this apparently rationally immature man, because you and all members know about the actual truth of your contacts etc. 45. Many amongst them were witnesses to your contacts as well as substantial experiences and sightings in connection with you and us, as is documented many times in the witnesses book. 46. And it must be said that if the man accuses you of lies, swindle and fraud, he also does that of far over 100 reliable witnesses. 47. Through everything he makes himself and his dirty and silly doings impossible and ridiculous before all those who know the truth. 48. In his simple-mindedness it is impossible for him to recognize this. 49. All those who are foolish enough to believe his falsehoods and slander without informing directly at the source of the truth, so the members of the FIGU community, make themselves equally impossible and ridiculous. 50. And it must be said, that all those who believe the man’s childish and silly falsehoods and slander without looking into it and clarify it, are also not honest and open enough to directly face the actual truth, by inquiring at the right source, the FIGU, instead at Abderites, liars, slanderers, fools and selfish antagonists who live in the illusion that they are above the truth and can slander it as they see fit. 51. Such people are unscrupulous elements who know neither honor nor dignity. I think so too. And those who in any way aid him in his dirty deeds, are just the same in my view, and irrespectively of who and what they are. But regarding the following: even though we do not respond to L.B.’s attacks, E-letters and faxes etc., I still think that what we have spoken about should be made known as bulletin information for the readers. With that we do not indulge L.B.’s wish to make statements regarding his E-mails and faxes etc. 52. That is right, because our conversation has nothing to do with a statement about his requests regarding E-letters and faxes, but it only concerns a pertinent conversation between the both of us. 53. It should absolutely stay that way, so there should not be a conversation about it, when the man makes such a request to you or the community members. Phobol Cheng, Ex-United Nations diplomat for Cambodia as a child stayed at the Ashoka Ashram, Mahrauli, New Delhi. Her grandfather was the head (remark = Buddhist monk) of the Ashram. She has a first-hand contact with Asket, her having seen Meier and Asket together on numerous occasions, her having witnessed Asket’s UFO craft hovering over the Ashram on more than one occasion. She once entered her grandfather’s Ashram, saw two strange men in white robes sitting one on each side of him, speaking to him. She overheard part of the conversation, and when it was over, the <men> just suddenly vanished in the same manner, apparently, as Meier himself has done many times at the beginning of a contact. So Phobol then knew that these men were not from Earth. A highly respected official breaks her anonymity a few years ago (1999) and speaks out in front of crowds to recount her stories on this, and what, pray teil, does she gain by doing this except possibly drawing ridicule similar to Meier? Mrs. Sashi, an Indian woman, who had tutored Phobol in the Hindi language, since coming from Cambodia she and her brother had had to learn Hindi. She didn’t look much older than Phobol, and so perhaps had been no older than 20 when Phobol was 10 when she had seen Meier and Asket in 1963 (when Meier still had his left arm). Sashi was a witness to Phobol having spoken to her briefly several times about the woman (Asket) who others at the Ashram referred to as <the goddess> or some such, and about her ship in the sky. Also Sashi herself saw space-crafts above the Ashram. So Sashi is an important witness and corroborator of Phobol’s Testimony. Not until July 1976 did Billy purchase his first color TV unit (brand SABA) from Mr. Baer’s Bauma store. Whereas the photos of Asket and Nera were taken a year earlier, on June 26, 1975. His first photos were taken with an old Olympus 35 ECR camera, which he, as a onearmed man, was able to utilise problem-free with only one hand. He bought this somewhat dilapidated camera (its aperture ring was stuck in one position) from his brother, Gottlieb Meier, in January 1975 for CHF 50.—. If, as claimed, the photos had been taken from a colour TV monitor in the 1970s, any enlargements of the picture would invariably also show the 3-colour grid of the cathode ray tube, which would show the colours blue, green and red arranged in three dots. This fact was previously investigated by SWISS photo technician, a printing specialist who worked with tenfold enlargements and other enlargement tasks. 229. It was rather extraordinary that you were given permission to take photos of Asket and Nera, since we have discovered terrestrial females who resemble them very closely and who, interestingly enough, also work together in a community of interests. 232. I would rather not do so for various reasons. Billy was aware that there were look-alikes of Asket and Nera in the USA in 1975, some 23 years before the skeptics found out in 1998. Why would Billy knowingly make mention of these <doubles> in America in his earliest published contact reports if, assuming he hoaxed those photos, they would possibly be detected later on as the back-up singers/ dancers in a popular American TV show? That is actually more improbable to me than the whole MIB fiasco, which, based on the amount of eyewitness testimony, should actually be given a bit more consideration. 7. That is satisfying for me, but I would like that you also publish everything in one of the next bulletins, because I think many people still do not know these facts and are grateful for this information, because many still believe the liars and slanderers in this regard and have fallen victim to the untruth. I will of course comply to your wish. It would be good if I make a special bulletin out of it again, because these have found special appeal, as I was repeatedly told by telephone. It will be the number 64, which I have scheduled for November. 10. What I’d like to say to you, I’d like to say without calling names, for as you have recently told me again, you cannot openly tell the truth, because this is not allowed by Swiss legislation, so you could be prosecuted, when you or I call names of persons who are liars, cheaters, swindlers, criminals, thieves and slanderers, etc. 11. The fact that such persons may not be officially called by name is extremely regrettable, for because of that they feel supported in their actions and deeds and even more so do everything possible to spread lies and slander, and commit thievery and deceit as well as criminal activity and swindle. 12. There should not be such a false legislation, which encourages such persons in their unworthy actions and deeds and punishes those who oppose against them and bring to light the truth. 13. But since this is the case, the whole thing about this legislation proves that it is not only extremely illogical and unjust, but also that a logical and just legislation is scoffed in application of these laws. 14. But now I would like to and also can give you an answer as to what we have stipulated in the official conversation on Thursday, Thursday, November 18, 2010, namely that we would clarify very precisely, whether the pictures in Guido’s book are real or fake. 15. Even back then I told you that it would take a lot of time, and unfortunately it actually took some time to clarify everything, because we had to undertake lengthy investigations into the past to clarify everything. 16. It is not necessary to explicitly cite all our efforts made and the correlating facts, because it is only important whether the Asket-Nera photos in Guido’s book are your original pictures and if they are manipulated, or if they are pictures with the American look-alikes. 17. Fact is that at the time a malicious group, of which the name is known to you because of several assassination attempts on you, passed original images to Schmid, the photographer who already in 1975 falsified your pictures, of both American look-alikes who appeared in a revue. 18. Under serious threats Schmid was forced to fit the pictures given to him together with your pictures, to join them together and falsify them, to discriminate you later world wide and be able to destroy your credibility, for which the reasons are known. 19. With these machinations it was already worked out that several unstable adversaries and boasting and high-handed persons, whom are known to you by name, should in the 1990s notice the American revue dancers respectively the look-alikes of Asket and Nera. 20. The period until then was calculated so that you and your mission should already be known world-wide in these years, so that a new and comprehensive intrigue and slander would bring a storm of outrage and would thereby cause a collapse of the mission. 21. The calculation of this was based on perfidious evoked slanders from the beginning of your mission, that you had maliciously and fraudulently falsified pictures of our beam ships as well as the pictures from your great journey. 22. Even these slanders arisen from the beginning were based on machinations of the aforementioned malicious group, because also for this very unstable and pathologically self overestimating, high-handed as well as notorious enviers and adversaries against the truth were influenced to such an extent, that they used all means to damage you and the mission with lies, deceit, insults and slander. 23. And as a result of the threats against the photographer Schmid by the aforementioned group he also became an adversary against you and the mission, whereby the lies and cooperation of a certain former FIGU member came in handy. 24. It was this person, who also stole from you and with like-minded people tried to damage you with tremendous slanders, which however thoroughly failed because all the righteous people remained faithful to the real truth and with that to your mission and the contacts with us Plejaren and their numbers increased. 25. Schmid, the photographer, according to the threats to him and force applied to him joined your original pictures with the original pictures of the revue dancers respectively the American look-alikes and accordingly made falsifying manipulations. 26. Of these forgeries he made new slides, which he returned to you as allegedly your own originals of the Asket-Nera slides. 27. Since you are not educated with regard to photography techniques etc., you didn’t notice the malicious deceit, but only after the deceit by the photographer Schmid respectively his falsification became public. 28. So you have the falsified pictures, which show Asket and Nera, as well as the two American look-alikes, hence they were also included in Guido’s book. So on the photos four different persons are manipulated together into two persons, whereby two women are identical to such an extent, that they cannot be distinguished from each other. 29. That’s right, and with that the matter is finally resolved. Which will not silence the adversaries. Actually I find the whole of these manipulations and machinations just as preposterous as the adversaries, who want to make profit by smear articles, lies, frauds, insults, swindle, photo- and film falsifications as well as slander etc. towards me, my photos and the contact reports as well as my books, booklets, materials and my mission. 30. It will certainly be the case that the adversaries will continue with their lies and slander etc. because stupidity, poor consciousness, foolishness, ignorance and abjection cannot be healed. 31. Und that everything is really preposterous and that all the adversaries make themselves ridiculous, that is a fact that is undeniable. On pages 8-10 of this book, excerpts from the Guido’s upcoming 2012 ed. ‘Und sie fliegen doch’ book (pgs. 337-342) were presented. See 2012 ed. of Und sie fliegen doch! for reference, below. Guido publishes a revised and expanded 2nd German edition after his first German edition 1991 book – Und sie fliegen doch! which again contains much more new information along with old information on pgs. 336-344, that mentions the results of the latest investigation conducted by Ptaah probably between Nov 18, 2010 (CR 505) – Aug 17, 2011 (CR 526), into the Asket-Nera photos that have been published in Guido’s book since 1991. Regarding American look-alikes with respect to the extraterrestrial Asket; Photos of Asket and Nera? New findings! At the beginning of his mission in 1975, <Billy> Eduard Albert Meier was obliged to prove his contacts with extraterrestrial visitors. At that time a part of the <tangible> evidence consisted of the creation of numerous photographs of beamships, weapons, landing traces or pictures of extraterrestrial persons. In the course of the gathering of evidence Billy had the opportunity on June 26, 1975 at 21:00 h to make some photographs of Asket and Nera in a great spaceship of the Plejaren. Afterwards these photographs were however falsified by someone else for defamatory purposes. The exact correlations regarding these circumstances were already described in 1998 in both the articles <An extremely unpleasant matter> by Billy and <Asket and Nera – American look-alikes on subsequently falsified Billy Meier photos> by Hans-Georg Lanzendorfer in FIGU Bulletin no. 16 from June 1998. As a result of tireless criticism and hostility with regard to the pictures of Asket and Nera it had namely been found, that the pictures had actually been falsified respectively manipulated by the photographer mentioned in the article. He had been forced to make changes to the pictures by malevolent elements. In the case of the photographs No. 109, 110 and 111, which is how they are identified in the FIGU albums and which supposedly show the two women Asket and Nera from the Dal universe, in reality it deals with maliciously foisted falsifications. Truthly, Asket and Nera are not shown on the photographs, rather two American lookalikes who were performing as singers in a dance group. The fact of these lookalikes was already mentioned and described by the Plejare Ptaah during the 39th official contact conversation of December 3th, 1975 (see Plejadisch-plejarische Kontaktberichte Block 2, page 40, sentences 229-232 as well as the 264th contact conversation of May 14th, 1998, Block 8, pages 14-16, sentences 2-35). In 1975, through malicious machinations of the organisation <Men in Black> and of Mr. Schmid, a photographer whom they had put under massive pressure, grave alterations and manipulations were done on the photographs from the Asket/Nera series. 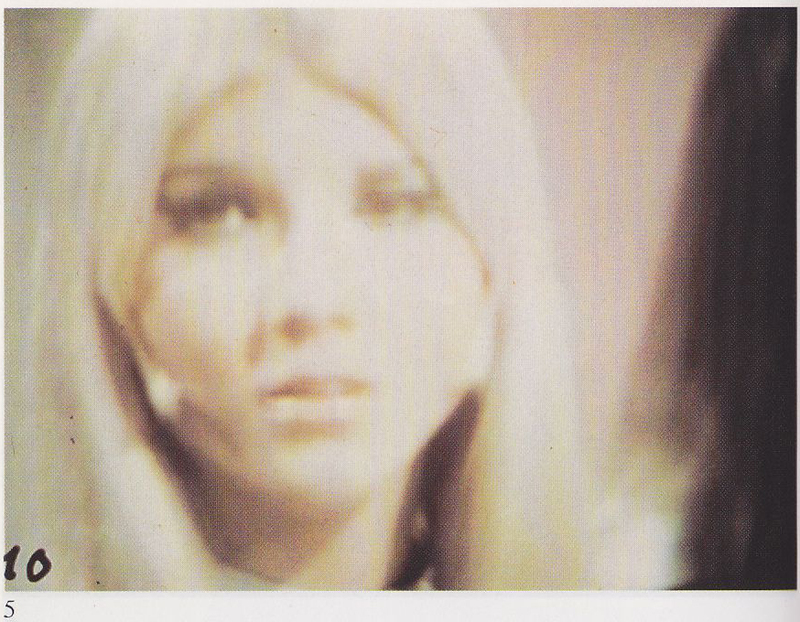 To this end, details of individual still photographs of a TV show, in which Asket’s and Nera’s lookalikes performed as singers in a group of revue dancers, were copied into BiIly’s original photographs. 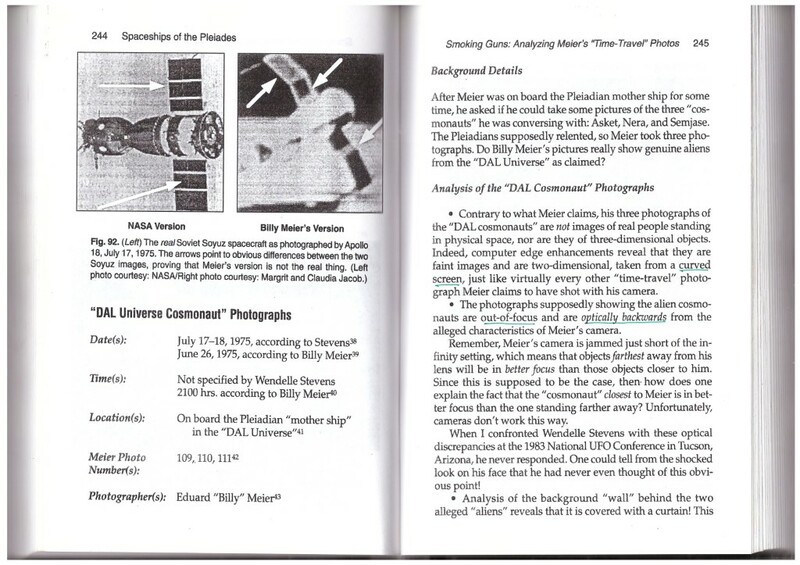 The intention was to thereby substantiate a lying claim that Billy Meier had taken the pictures directly from a television screen. So in fact and in truth, the aforementioned photographs are not pictures of Asket and Nera. Unfortunately this fact was first discovered in May 1998, nearly 23 years after the photographs were taken. The more precise circumstances of how it came to these manipulative falsifications can be found in the June 1998 issue of the monthly FIGU publication <Stimme der Wassermannzeit> as well as in FIGU Bulletin No. 16. Since learning of the falsifications, the photographs 109, 110 and 111 are still being sold by FIGU, but are since that time correctly identified as photos of the American lookalikes of Asket and Nera. Conclusion: Although the pictures were falsified by someone else’s hand — which is something that FIGU and Billy regret very much at least the photos have, through the falsification, brought forth a fact whose truthfulness makes the Billy Meier case even more interesting and conclusive. 1. Photo no. 110 (according to the photo index of FIGU), on which allegedly Asket is shown, is in fact a maliciously foisted forgery respectively falsification. 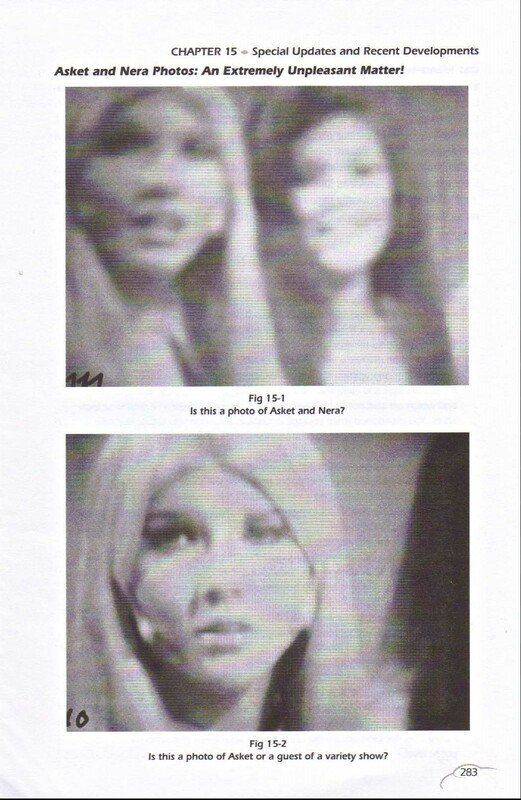 The picture doesn’t show Asket as described, but an American look-alike, a singer from a dance group, as already described by Ptaah in the 39th contact report from December 3, 1975 (which was forgotten by Billy as a result of his very serious health collapse in 1982, and he only remembered again when it was pointed out again by Ptaah etc. in the year 1998). By malicious machinations of the organisation <Men in Black> and the photographer named Schmid from the Rheintal (deceased), who was put under massive pressure by them, serious changes and manipulations were made to the Asket/Nera series in the year 1975. 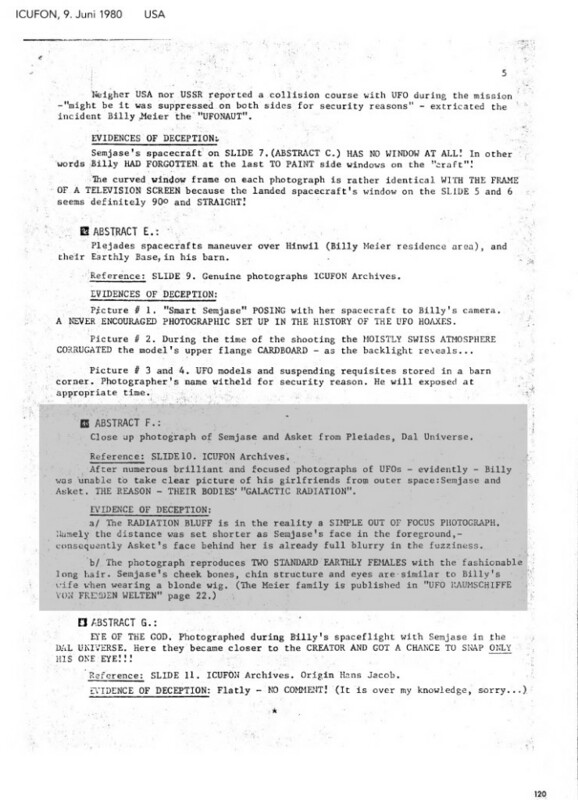 Sections from single frames were copied from a TV show, in which the look-alikes of Asket and Nera performed as singers of a revue dance group, and were copied into Billy’s original photographs. With that a mendacious allegation should be supported that Billy Meier took his pictures directly from a TV set. So in reality the aforementioned picture is an image of Asket’s terrestrial look-alike. Unfortunately these facts were only established in May 1998, so some 23 years after taking the photographs. The exact circumstances, how it came to these manipulative falsifications, can be read in our three-monthly magazine <Voice of the Aquarian Age> No. 107 from June 1998 as well as in Bulletin no. 16 from June 1998. As mentioned the same is the case for the photos no. 109 and no. 111 (FIGU registration number). The photos will continue to be sold by us, however since May 1998 they are referred to as American Asket/Nera look-alike photos. Bottom line: the pictures are indeed falsified by someone else, which we regret very much of course – but at least the pictures have effected a circumstance to verify its veracity, making the Billy Meier case even more interesting and even more conclusive. 2. According to Billy the extraterrestrial women, at least those he has got to know, only use colored eye lenses and possibly colored head hair, solely for medical reasons, if at all. All other claims belong in the realm of fantasy. 3. The claim that Billy has declared two normal Earth women with fashionable long hair as aliens – and his ex-wife Kalliope was wearing a blonde wig for this purpose – is frankly ridiculous. Even with the best will in the world I cannot imagine how one would prove with the help of a wig, that the wearer is an extraterrestrial woman. I see practically no similarity between Kalliope and the portrait of Nera (mistakenly referred to as Semjase by the critics), even with a blond wig. And Billy’s ex-wife of all people would have participated in this fraud, although she is the last person to consider, because she was openly and viciously hostile towards Billy’s mission and his contacts, as can be confirmed by all those who have personally got to know her. 4. Another note on the strongly elongated earlobes of the Plejaren: On one hand they represent the only anatomical difference between the aforementioned extraterrestrials and the white Earth people, on the other hand it is absolutely erroneous to speak about a better hearing because these ears are only slightly longer than ours (about 1-1.5 cm).